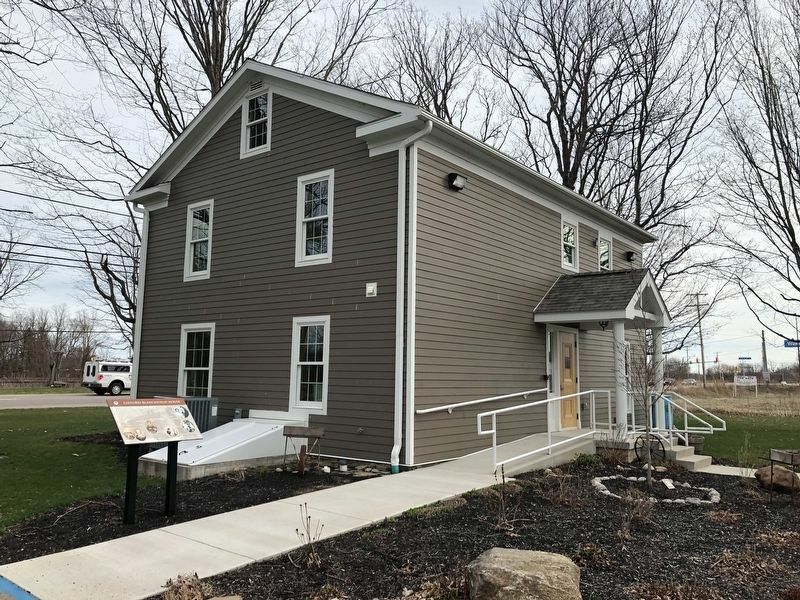 lifelong affection for the historic family dwelling, when she donated it to Harborcreek Township. 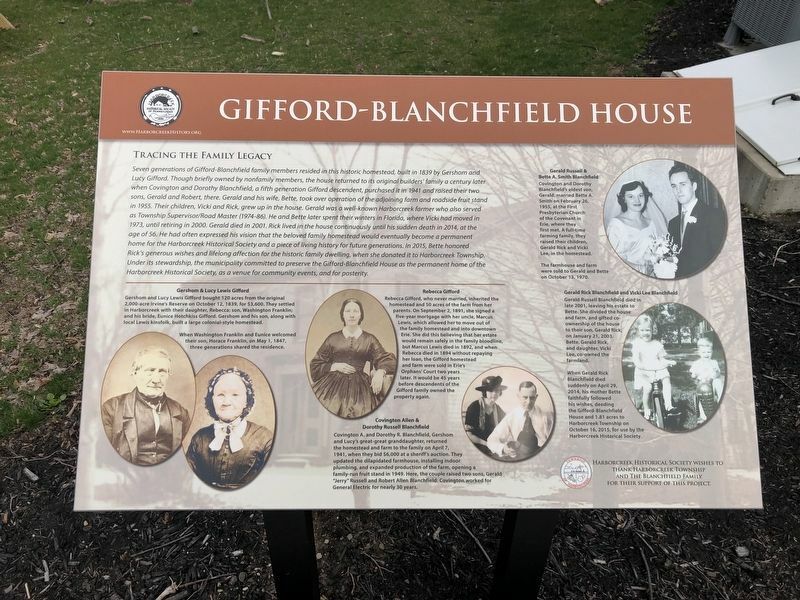 Under its stewardship, the municipal committed to preserve the Gifford-Blanchfield House as the permanent home of the Harborcreek Historical Society, as a venue for community events, and for posterity. Gershom & Lucy Lewis Gifford Gershom and Lucy Lewis Gifford bought 120 acres from the original 2,000-acre Irvine's Reserve on October 12, 1839, for $3,600. They settled in harborcreek with their daughter, Rebecca; son, Washington Franklin; and his bride, Eunice Hotchkiss Gifford. Gershom and his son, along with local Lewis kinsfolk, built a large colonial-style homestead. When Washington Franklin and Eunice welcomed their son, Horace Franklin, on May 1, 1847, three generations shared the residence. Court two years later. It would be 45 years before the descendents of the Gifford family owned the property again. Covington Allen & Dorothy Russell Blanchfield Covington A. and Dorothy R. Blanchfield, Gershom and Lucy's great-great granddaughter, returned the homestead and farm to the family on pril 7, 1941, when they bid $6,000 at a sheriff's auction. They updated the dilapidated farmhouse, installing indoor plumbing, and expanded production of the farm, opening a family-run fruit stand in 1949. Here, the couple raised two sons, Gerald "Jerry" Russell and Robert Allen Blanchfield. Covington worked for General Electric for nearly 30 years. Gerald Russell & Bette A. Smith Blanchfield Covington and Dorothy Blanchfield's eldest son, Gerald, married Bette A. Smith on February 26, 1955, at the First Presbyterian Church of the Covenant in Erie, where they first met. A full-time farming family, they raised their children, Gerald Rick and Vicki Lee, in the homestead. The farmhouse and farm were sold to Gerald and Bette on October 13, 1970. Gerald Rick Blanchfield and Vicki Lee Blanchfield Gerald Russel Blanchfield died in late 2001, leaving his estate to Bette. She divided the house and farm, and gifted co-ownership of the house to their son, Gerald Rick, on January 21, 2003. Bette, Gerald Rick, and daughter, Vicki Lee, co-owned the farmland. 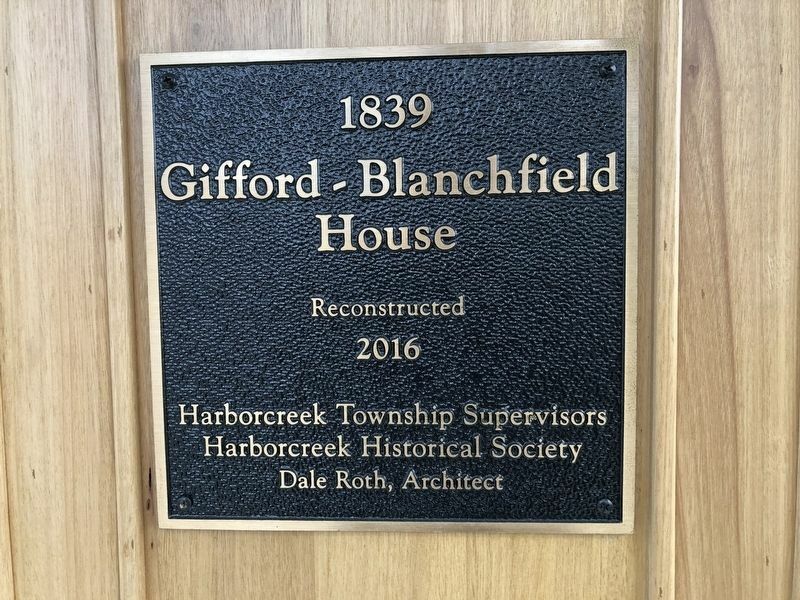 When Gerald Rick Blanchfield died suddenly on April 29, 2014, his mother Bette faithfully followed his wishes, deeding the Gifford-Blanchfield House and 1.81 acres to Harborcreek Township on October 16, 2015, for use by the Harborcreek Historical Society. Erected by Harborcreek Historical Society. Location. 42° 9.557′ N, 79° 58.366′ W. Marker is near Erie, Pennsylvania, in Erie County. Marker can be reached from Municipal Drive south of Buffalo Road (U.S. 20), on the right when traveling north. Touch for map. Marker is at or near this postal address: 5661 Buffalo Road, Erie PA 16510, United States of America. Touch for directions. Other nearby markers. At least 8 other markers are within 3 miles of this marker, measured as the crow flies. Fighting for Peanuts: The Gauge War (about 300 feet away, measured in a direct line); This Fireplace (about 300 feet away); Harborcreek Area Veterans Memorial (about 400 feet away); Bryan Bell Memorial Playground (approx. 0.4 miles away); King Pavilion (approx. 0.4 miles away); We Owe So Much To So Few (approx. 2.2 miles away); John Nelson (approx. 2.3 miles away); Niagara Hall (approx. 2.8 miles away). Touch for a list and map of all markers in Erie. More. Search the internet for Gifford-Blanchfield House. Credits. This page was last revised on April 15, 2019. This page originally submitted on April 15, 2019, by Devry Becker Jones of Washington, District of Columbia. This page has been viewed 27 times since then. Photos: 1, 2, 3. submitted on April 15, 2019, by Devry Becker Jones of Washington, District of Columbia.